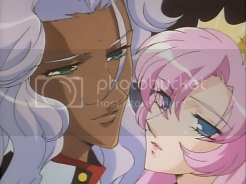 Revolutionary Girl Utena is one of those precious gems you rarely run into. There is just so much going on. The characters are just awesome and overflow with character development. The huge symbolism is overwhelming, and till each of these symbols has some kind of hidden meaning. The story is about a girl whose parents died when she was young. She kept crying, until a prince was there to comfort her. He gave her a ring with a roze crest on it, and left. The girl was so impressed by this, that she vowed to become a prince herself. 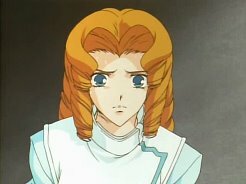 This girl is named Utena. Hence the title. When she grows up, she eventually ends up in a very strange high-school. In there, the members of a very eccentric student council fight over a girl called the Roze Bride, or Anthy Himemiya. The one who manages to eventually win her gets the power to revolutionize the world in the end. 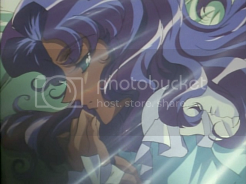 Utena then ends up winning a duel agains the current holder of the Roze Bride. Afterwards, the members of the student council keep trying to take Himemiya away from her. In order to defend Himemiya, Utena has to keep winning sword duels against them. This anime is divided into three parts. Each of this parts features a special on Utena, but more importantly, each of the members of the student council. This means three opportunities for each of them to delve deeply into their characters, producing magnificent results. In the first part, Utena’s new, and each of the characters gets introduced, including their stories, resulting in a nice climax. In the second part, the story takes a side-road in order to show a side-story of the show, centered around the boys of the black rose. In there, we get to see the characters who are closest to the members of the student council. It’s their turn to get developed and explained. I like the way this starts out extremely serious, and ends more and more chaotic, also resulting in a very satisfying end battle. In the third part, the goodness really starts. The student council members develop even more deeply than before, resulting in amazing scenes. The battles for the roze bride get more amazing by the minute, until the ending really blows you off your chair. One of the things I really loved about this anime is the amazing cast of characters, and especially the way they were used. The anime basically only plays in a high-school-ground. So everything and everyone should have close contact with each other. But for every arc, only a few characters are selected and we get so see some very in-depth scenes. The other characters, during these moments, are totally put out of the spotlights. Including even Utena at times. This has a great effect. You really focus on nothing else than the creators want you to, but still you long to see the other characters appear again. This was especially noticable at the end of the series. There is an aweful lot of repetition in this show. For each episode devoted to the plot, you already know that certain things will happen, including numerous recycled scenes. At first, these scenes may become bothersome, but as the series progresses, the creators manage excecute these repetitions better and better. Here we come to another magnificent point of this series: there may be a lot of repetition. You know that certain scenes and events will be playing. Outside of these scenes and events, however, You absolutely WON’T be able to guess what will happen next. This series always leaves you guessing at those points. The creators also managed to include an excellent taste of humour in the anime. It doesn’t even need funny faces to be brilliant. It makes brilliant use of the naiveness of the characters, of silly coincidences and characters just acting totally wacky and having brilliant, though insane ideas. I especially loved the Kashira girls, but also Nanami the use of symbols amused me more and more. The Kashira girls are some kind of drama-club, who perform very interesting shadow-plays. They return each episode, and each time their play is about some kind of moral issue debated about in the anime. Each of these plays is just horribly brilliant. The music is another extremely strong point of this anime. Both in the duels between the characters as in very dramatic scenes, the background music is top-notch, certainly giving even more emotions to the already emotion-packed scenes, turning the fragments into total roller-coaster-rides. The battle choreography is brilliant in the beginning, then slows a bit down in the middle of the show, but then, around episode 25, it turns into some of the best ever. Not in terms of Jubei-Chan-fast-moving, but in the movement of the characters themselves. This is the first anime in which I could actually see the characters giving all they had in defeating the opponent. Other anime try to also create this effect, by making the characters be in pain, or extremely angry. But still, it doesn’t bring the best in them up. Utena, however, manages. As the series progresses, the episodes get more awesome by the minute. Especially starting from episode 30, the episodes are just incredible to see. The ending episode was also among the best of its kind, which is an extremely good job. I totally loved it. This anime just screams out the word elegance. Starting from the character art, to the way they move, act, speak. Everything is so elegantly executed. This anime has style, and knows how to use it. Even though the drama is awesome, at times, the show takes its time perhaps a bit too long. Some of the cases are dragging a bit on, even though they provide terrific results. This should be too great of a bother, but still, it might agitate some. Overall, this is just an amazing anime, dated from a couple of years ago. I totally recommend it. I still think that the movie trumps the series only because of the greatest racing metaphor ever at the end. 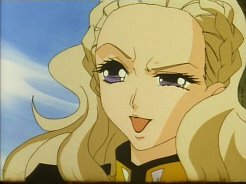 Still, I have Rinbu Revolution on my mind after 10 years of first watching Utena. Still, gratz to finishing blogging the series. Definitely a good accomplishment. I’m definately curious about the movie now. I was totally surprised when I found your blog tonight and thought that this review of Utena could have been written by me and my best friend. 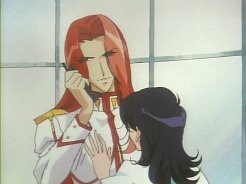 I actually hope that utena becomes a new series. I think this is way better than one in and escaflowne. Simoun and mahou shoujotai are on this level though.